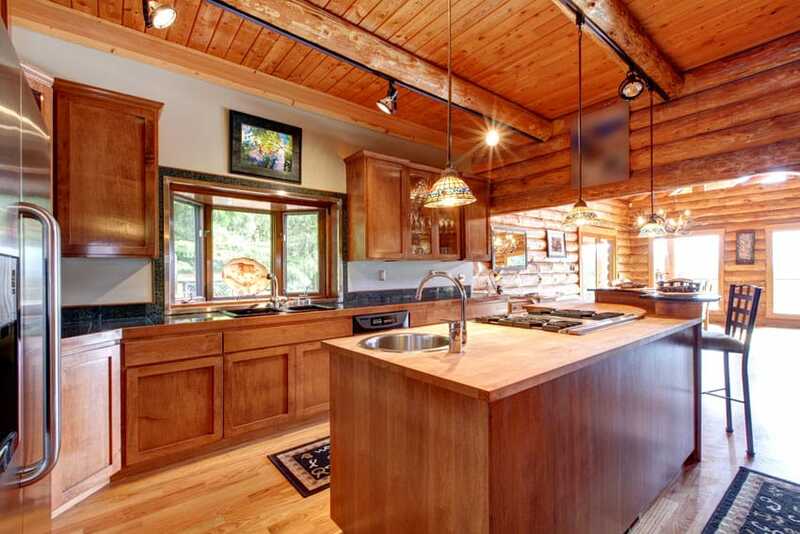 Welcome to our gallery of log cabin kitchens showcasing a variety of designs, finishes and cabinet styles. 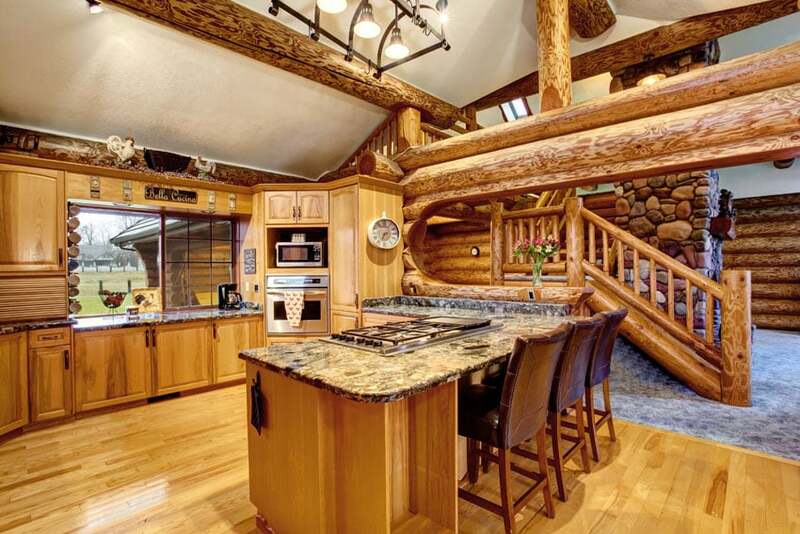 This luxurious log cabin home features the gorgeous natural finish of the timber used, letting the natural knots and other imperfections of the wood come through. For the kitchen, the aim is to visually separate it from the other areas of the home, without using partitions and while still maintaining the natural feel of the interiors. To do this, black slate tiles was used for the flooring, for its textured surface, resulting in a very natural feel. We have seen architecture, interior design and furniture design evolve, go out of style and go back in style over the years. Different environmental, social and economic factors have all affected and triggered these changes, and so design styles have evolved to accommodate these changes. Log cabins, for example, dates back from a very long time ago in Scandinavian countries and brought to America when Europeans came to settle. They were originally used as a dwelling when pioneers arrived in a new land. These buildings were made by only using cut trees and has no need for nails or glue. While the original log cabins were mostly utilitarian, today’s log cabins are mostly adapted as a “style” used in country homes or vacation homes, and an now be seen with simple designs to the most luxurious design styles. 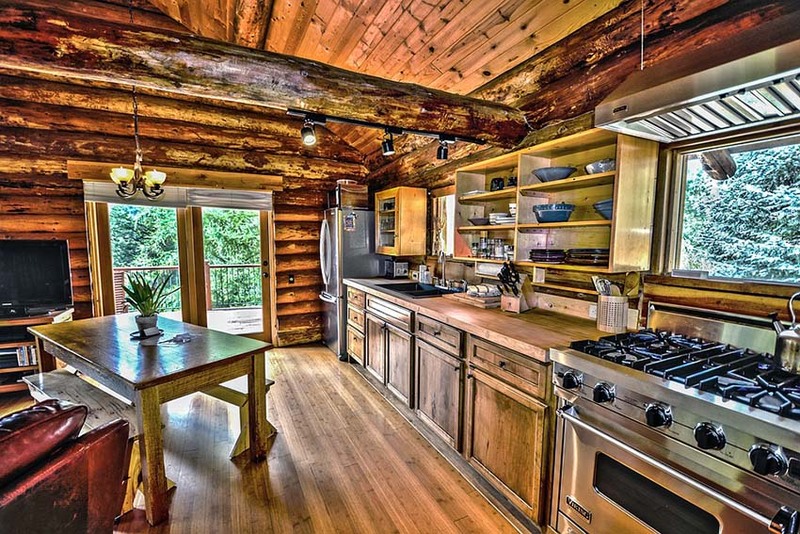 One of the most interesting parts of log cabins would definitely be the kitchen, as you will find different approaches and techniques to achieve different looks. 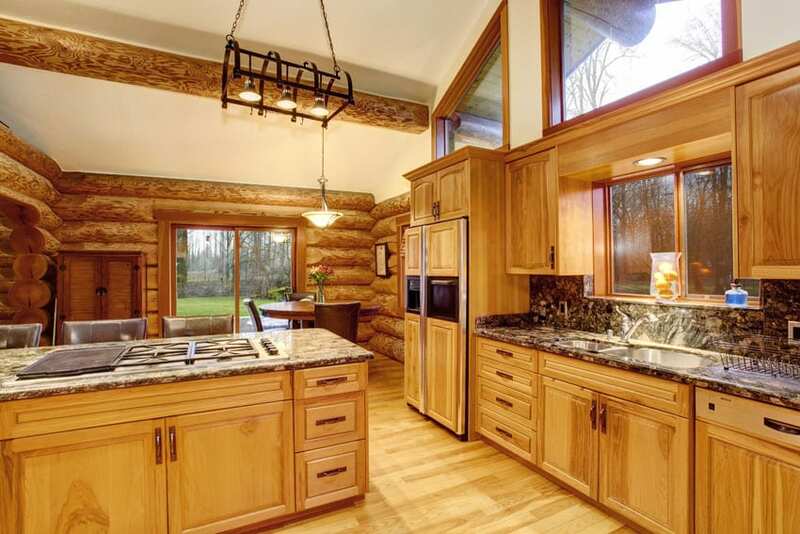 Since log cabins put emphasis on natural finishes, kitchen cabinets are usually made of solid wood. It can be finished to match the color of the log cabin finishes, or can also be completely different. Solid colored cabinets can also be found, but they are usually still made from solid wood and are simply painted over and given a weathered finish. 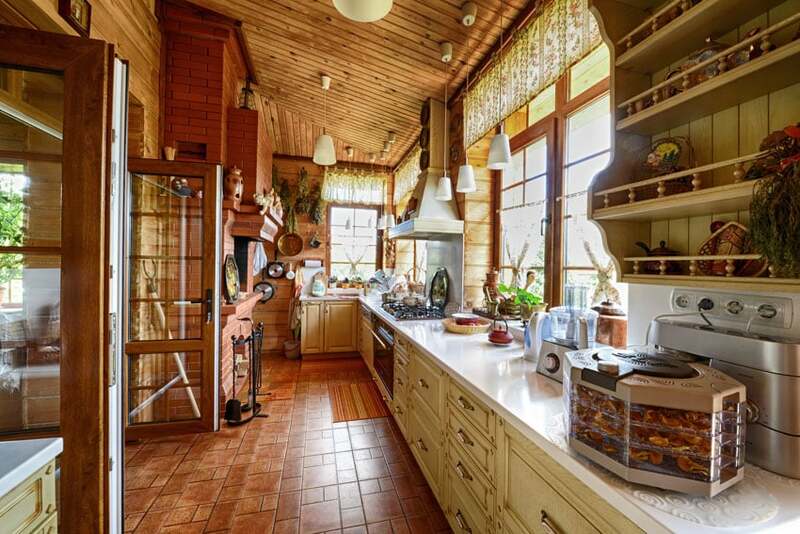 For the countertop, log cabin kitchens are often seen with a variety of natural stones, both smooth and rough such as slate, granite, travertine, sometimes even hammered metal, stainless steel or solid wood. Countertops can be a great way to add contrast to dark or light wood. Lighter color countertops can be used to help the space from feeling too dark and help emphasize a warm environment. 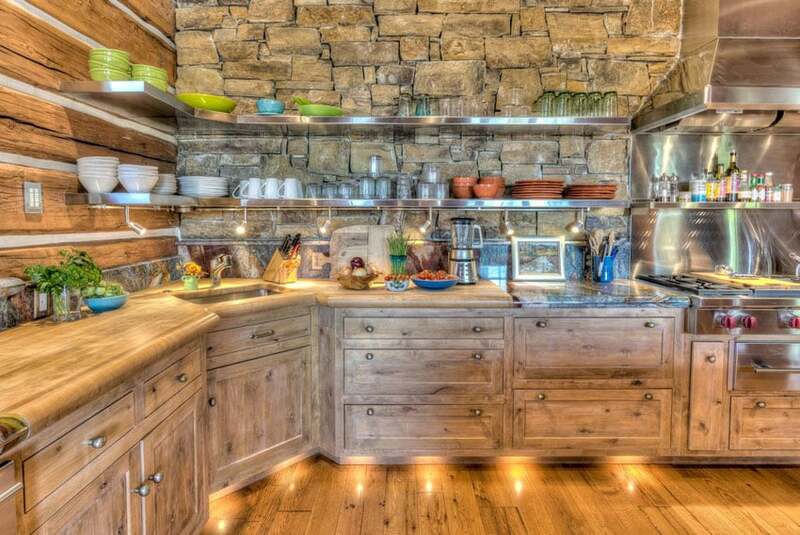 The rustic appeal of log cabin kitchens are further enhanced by using unique elements and light fixtures. You will often see apron sinks, hammered metal, bronze, wrought iron, and other decorative elements to help reinforce its natural look. Multicolor backsplash made from stone or tile is also a great way to add detail and give it your own sense of style. This compact log cabin has a sleek modern design, using gorgeous solid cherry wood for its structural framing, as well as the doors, windows and other finishes. 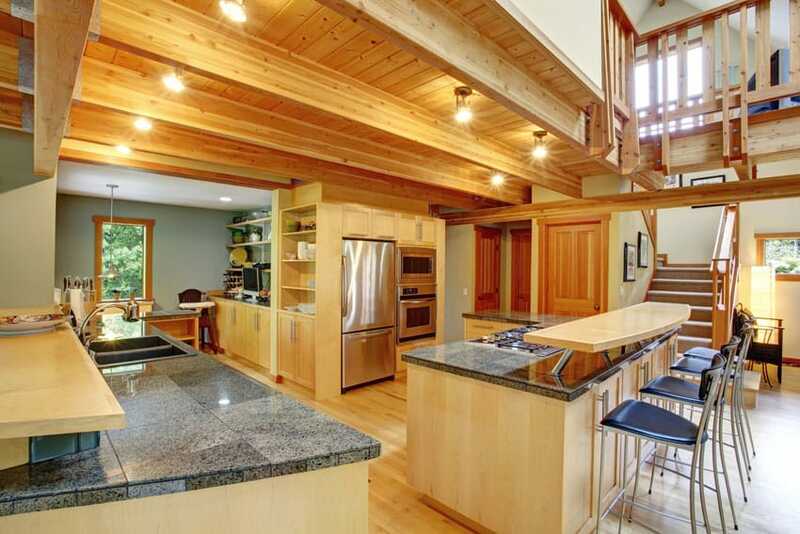 The kitchen naturally follows the over-all concept o the log cabin, using cherry wood for its kitchen cabinets, but in a lighter finish with more toned-down red undertones. It also combines it with a dark teal overhead cabinet, a unique limestone backsplash with stainless steel behind the stove for easy grease cleaning. By combining a variety of color tones, this log cabin is able to give more depth and playfulness into the design. Terracotta tiles were used for the floors, white antique white was used for the kitchen cabinets to create a good transition in between the pine wood wall panels and the terracotta floors. You will also see a different wood color used on the wooden ceiling slats, which helps create more depth and variety. Going for a modern aesthetic route, this log cabin kitchen uses lighter colored wood materials to create a bright and fresh looking kitchen design. In this particular example, light pine wood were used for the kitchen cabinets, which matches the engineered wood flooring and creates a subtle contrast against the cherry wood used on the wooden beams and doors. By combining different textures and depths, this log cabin kitchen is able to achieve a clean and light look for its kitchen despite using the uniform wood and finish color of the entire design. The timber structure uses a teakwood-toned finish, which is also used on the ceiling wood slats and the solid wood kitchen cabinets. Also, to help tone down the heaviness of an all-wood design, the walls of the kitchen are flat drywall panels for a cleaner canvas. 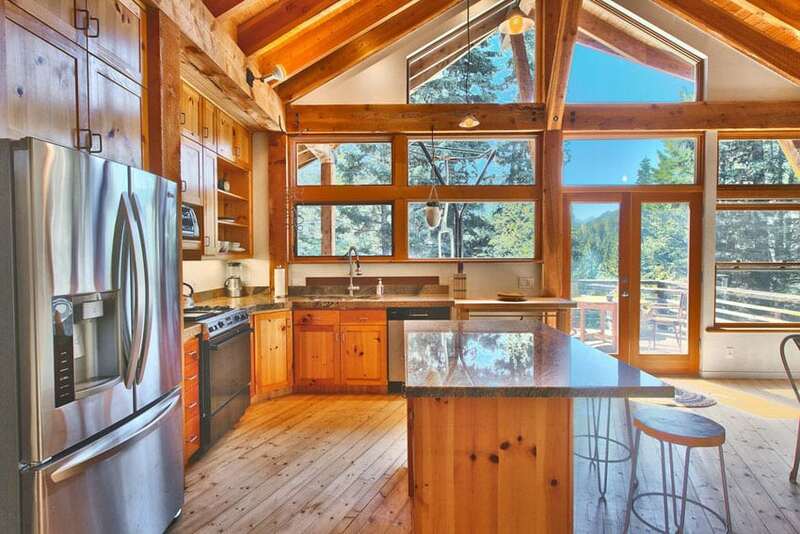 High ceiling and large picture windows makes this modern log cabin kitchen look more welcoming and less heavy, because of the abundance of natural light and the spacious ceiling area. The solid timber logs on the walls has a gorgeous walnut finish, while the floors uses Maple for a lighter finish. The kitchen cabinets are made from gorgeous solid golden oak, giving it a very natural look and a polished finish. This log cabin uses wood logs with prominent burls, giving it a unique pattern and look. For this reason, the kitchen uses lighter and smoother wood finishes to help balance it out and create a kitchen which still looks bright a clean even with the extensive use of wood. Solid Ipswich pine was used for all the paneled kitchen cabinets and were finished with natural linseed oil for a subtle smooth sheen. 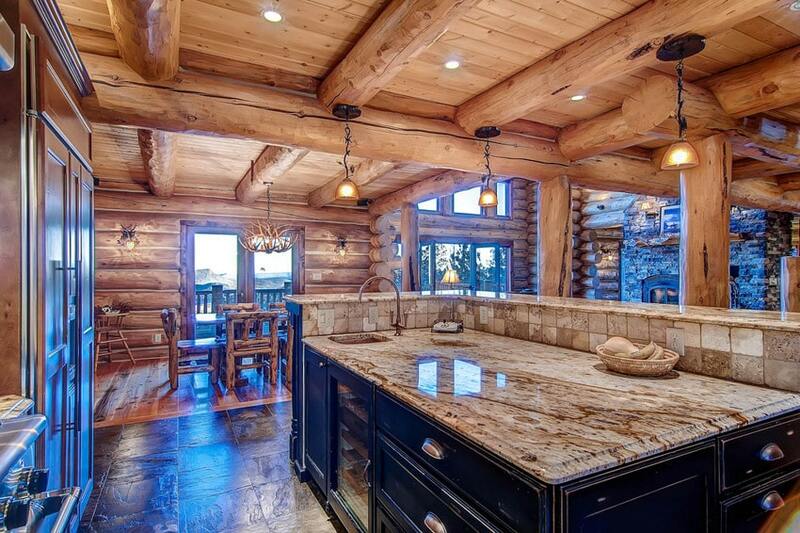 This log cabin kitchen goes for a heavier, rustic/antiquated look. 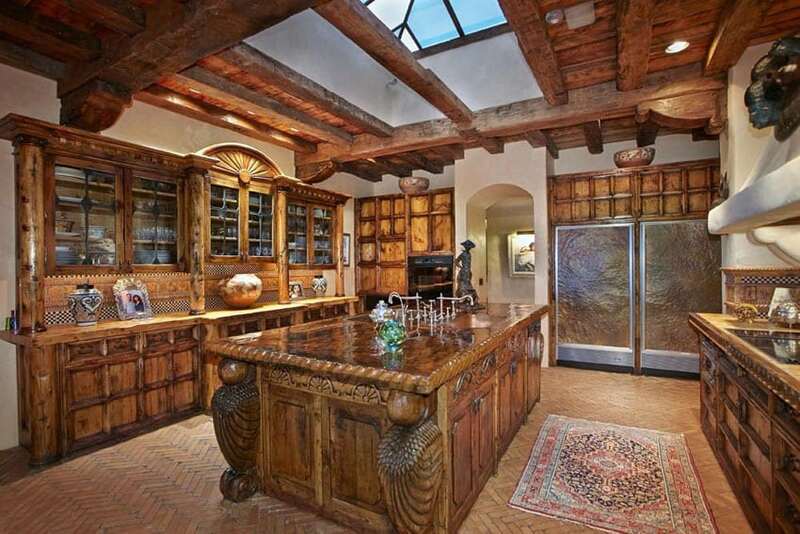 It uses reclaimed wood and antique cabinetries to achieve a very aged look. This spacious kitchen uses reclaimed solid wood beams for the ceiling, and has kept its natural aged finish and texture. The floors are also quite busy as it uses terracotta bricks in a basketweave pattern. The walls on the other hand, are simply painted in an antique white finish to balance out the look and to create a light and clean background for the heavy wooden kitchen cabinets. By keeping the natural texture of and finish of the wooden logs and simply giving it a few layers of clear coating for protection, this small log cabin gives a very rustic and lived-in appearance. This type of finish could appear too busy for some, so to balance it out, the flooring used is light walnut and paired with walnut kitchen cabinets. 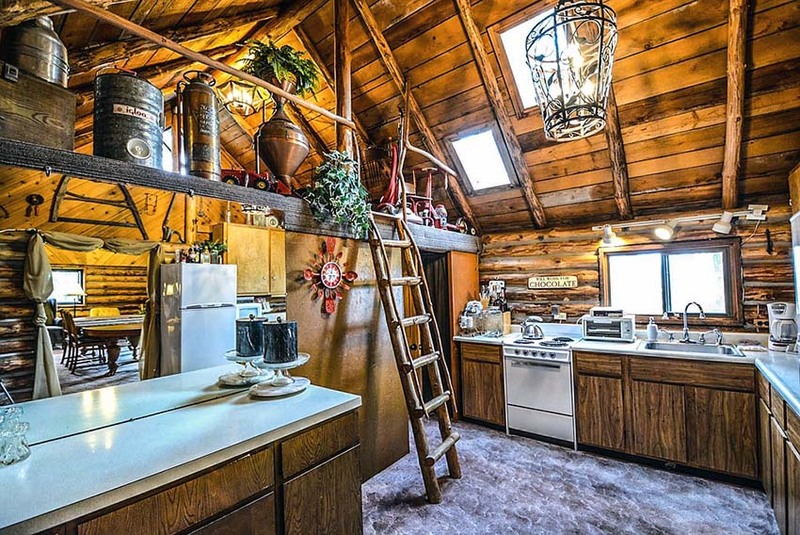 The high ceiling and the skylights makes this stunning log cabin kitchen even a better place to work in as it has better ventilation and more natural light. The consistent use of walnut on the cabin structure and the kitchen cabinets makes them look like they’re one with the structure, while the concrete look vinyl flooring and the quartz countertop helps tone down and create a break between the wood finishes. A large mirror panel was also added to make the space feel bigger. 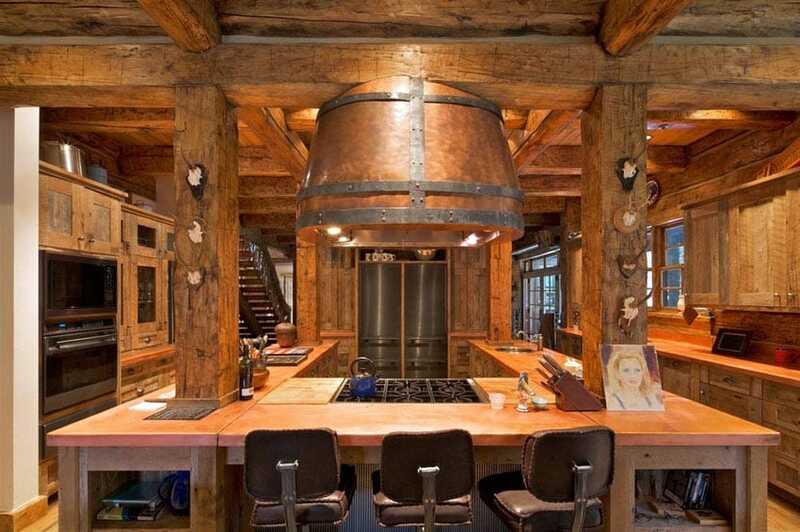 This beautiful rustic wood kitchen features a custom u-shaped island with breakfast bar seating, large wood beams and an amazing copper range hood. Combining natural stone, stainless steel and 2 wood finishes and 2 countertop materials in one kitchen space sounds too busy in theory, but this design is able to pull it off. The walls of the kitchen uses natural stones for one wall and mahogany driftwood pieces on the perpendicular side and matches the finish of the solid wood floors. Kitchen equipment, backsplash and the open shelves are in stainless steel, while the kitchen cabinets uses weathered oak, topped with a combination of beige travertine and black granite. 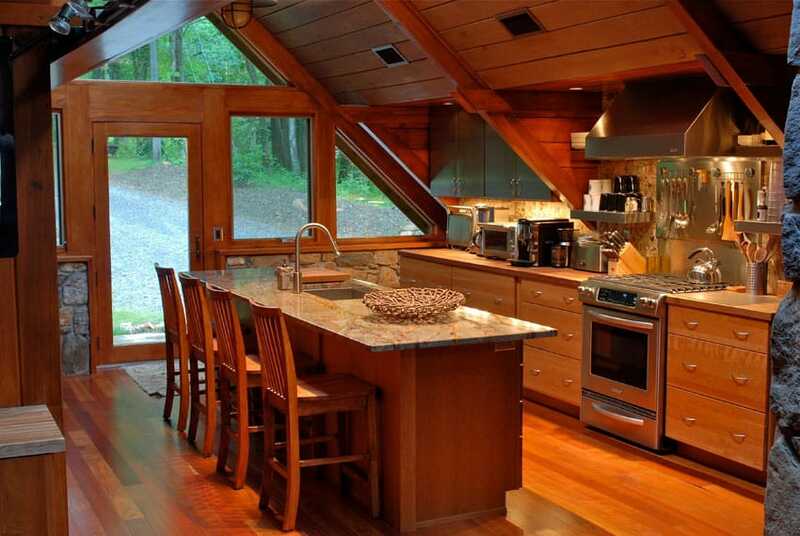 This gorgeous kitchen space is a great approach in creating a more contemporary style log cabin kitchen. Weather oak planks were used all over the flooring, creating a light and neutral base. Walls were plain and painted in oatmeal to create a clean canvas and give more emphasis to the gorgeous cherry wood used all-over the design. The kitchen cabinets is also using the same wood finish, and tops it with black travertine to give a bit of contrast.